Hope everyone had a wonderful Thanksgiving! Now what are you going to do with all of those leftovers? One recipe we just had to share is for a Roast Turkey Cuban Sandwich. Recipe courtesy of Closet Cooking. Yum! What do you like to do with your Thanksgiving leftovers? Share your favorite recipes in the comments below! Pair these mini chicken pot pies with a salad for an easy dinner or eat them as a healthy snack! Freeze any leftovers and reheat in the oven whenever needed – no defrosting required. Recipe courtesy of the Food Network Kitchen. Special equipment: a 4-inch round cookie cutter. For the dough: Whisk the egg with 3 tablespoons cold water in a small bowl. Pulse the flour, 1/3 of the butter, Parmesan, vinegar, 1/2 teaspoon salt and 1/4 teaspoon pepper in a food processor until the mixture looks like fine meal. Add the remaining butter and pulse until the mixture is in pea-size pieces. Add the egg and pulse until the dough begins to come together. Preheat the oven to 375 degrees F. Line two baking sheets with parchment. Bake the pot pies until they’re golden brown and the filling begins to bubble, 20 to 24 minutes. Let cool slightly before serving. Alternatively, freeze the unbaked pot pies for up to 1 month, then bake, from frozen, in the oven, preheated to 375 degrees F, until they’re golden brown and the filling begins to bubble, 20 to 24 minutes. Let cool slightly and serve. What are some of your favorite meals to make? Share in the comments below! This tender and juicy pulled pork starts with a surprising choice: pork tenderloin. By simmering large pieces of pork tenderloin in a tangy sauce and then shredding it with two forks the result is tender pork tossed with lots of rich flavorful sauce. The final touch is a crunchy broccoli slaw with a mustardy dressing. Today’s Foodie Friday is a summer dessert will satisfy any guest’s sweet tooth! It’s a healthier version of a traditional cobbler, with canola oil instead of some of the butter and whole-wheat flour instead of all-purpose flour. Other fruits may be substituted as well. Per serving: 182 calories; 8 g fat (3 g sat, 3 g mono); 11 mg cholesterol; 26 g carbohydrates; 3 g protein; 3 g fiber; 212 mg sodium; 140 mg potassium. Don’t forget – you have a chance to win a $25 Sullivan Tire gift card if you submit a recipe to Foodie Friday! Simply leave your recipe in the comments, or email it to customerrelations@sullivantire.com, and you’ll be entered to win! We have been craving Lobster Rolls all week, so we’ve decided to find a fabulous recipe for this week’s Foodie Friday! Pour water into a large pot to a depth of 1 inch; bring to a boil and salt generously. Crack lobster shells, pick meat from tail and claws, and cut into 1/2-inch pieces. Mix lobster, celery, lemon juice, chives, and 2 tablespoons mayonnaise in a medium bowl; season with salt and pepper and add more mayonnaise, if desired. Do you have a recipe you’d like to share on Foodie Friday? We’d love to hear from you! Leave a recipe in the comments, or contact customerrelations@sullivantire.com, and you’ll also be entered to win a $25 Sullivan Tire gift card! 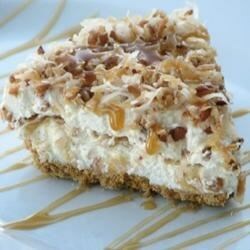 Today’s Foodie Friday is a delicious treat for a hot summer day: caramel drizzle pie. Since it is a freezer pie, you’ll want to make it the day before and let it freeze overnight. Place butter in a medium skillet and melt over medium heat. Add coconut and pecans, stirring to coat. Sauté until coconut and pecans are lightly toasted, about 5 minutes. Set aside. In a large mixing bowl, whip together condensed milk and cream cheese until fluffy. Fold in whipped topping. Spoon 1/4 of cream cheese mixture into each graham cracker crust. Drizzle each with 1/4 of caramel topping. Repeat layers with remaining cream cheese mixture and caramel. Top each pie with coconut and pecan mixture. Freeze overnight. Today’s #FoodieFriday is a double feature: two recipes that will be perfect for your upcoming Fourth of July celebrations (programming note: Foodie Friday will be on vacation next week with the rest of the country). Both of these recipes come courtesy of the Sullivan Tire corporate office: Beth’s Turkey Burgers and Chelsey’s Pasta Salad! Saute the garlic, mushrooms for a few mins, then add the spinach until wilted. Allow to COOL. In large bowl, add turkey and all ingredients. Mix well with HANDS! Cook pasta as directed, then cool with cold water. In a large mixing bowl, add the cool pasta, all of the veggies and dress with about half a bottle of dressing. Finally, add half a container of the McCormicks seasoning. What are you making for your Fourth of July celebrations? Did you try last week’s Southwestern Black Bean Salad? (I did! I added some quinoa to the recipe and have been enjoying it every week for lunch) What did you think?